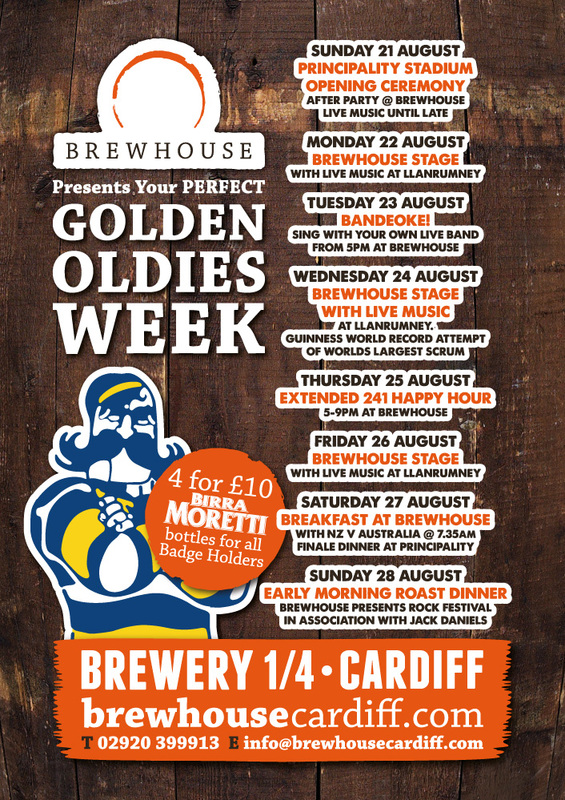 Brewhouse, Cardiff’s best live music and sports venue, is to host over 100 teams from 25 countries descending on Cardiff next week (21st August until 28th August) to take part in the world’s biggest rugby festival, The Golden Oldies World Rugby Festival. Brewhouse is supporting the festival by supplying live music acts at the opening and closing ceremonies at the Principality Stadium, as well as keeping the teams entertained on the Brewhouse stage with local acts performing during the playing days at the University playing fields in Llanrumney. As well as supplying live music throughout the week, Brewhouse is also hosting the opening ceremony after-party and is serving a special Golden Oldie Ale, with 10 pence from each pint sold going to the Wooden Spoon Children’s Charity. The Wooden Spoon Charity aims to change the lives of disabled and disadvantaged children through the power of rugby. On Wednesday, August 25th, the Golden Oldies Festival is also going to attempt to break the Guinness Record for the world’s largest scrum, which will be officiated by referee Nigel Owens. This is the 21st Golden Oldies Rugby Festival which are held roughly every two years in rugby loving destinations around the world. It is a veteran event where teams of men and women aged over 35 come together to play and celebrate the game.